Hear the thunder and roar of explosive percussion, the sonorous rattle of rain sticks and the resonant play of exotic instruments in this dynamic collection of world beat drumming. 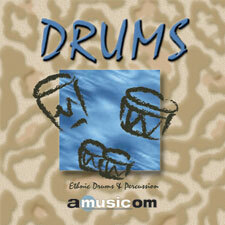 Forest gods, tantric rituals, magic and menace are summoned by the hypnotic beat of authentic world drumming. Experience the powerful beat of Amusicom's drumming circle.